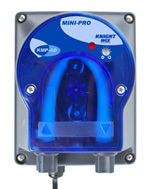 The Mini-Pro Series is Knight's newest line of small and reliable dosing pumps with adjustable flow rates for single tank dish washers and glass washers. This compact, sleek peristaltic pump is designed to dispense liquid detergent or rinse aid. The Mini-Pro is the low-cost solution to your warewash dispensing needs. programming to analog simple potentiometer setup to conductivity controlled.